Following up on yesterday’s post, here’s the second card I made for this Danipeuss Card Challenge! Hallo! Ich bin hier mit meiner zweite Karte für diese Danipeuss Karten Challenge! 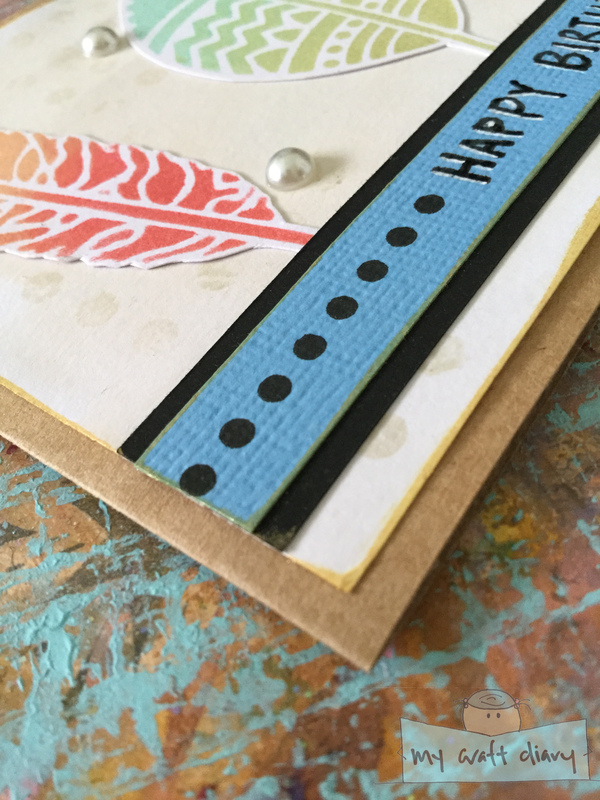 You will notice that I used the same feather elements as the first card since I already have them out on the table. In this design, I laid the feathers overlapping each other to make it kind of floating/falling down. 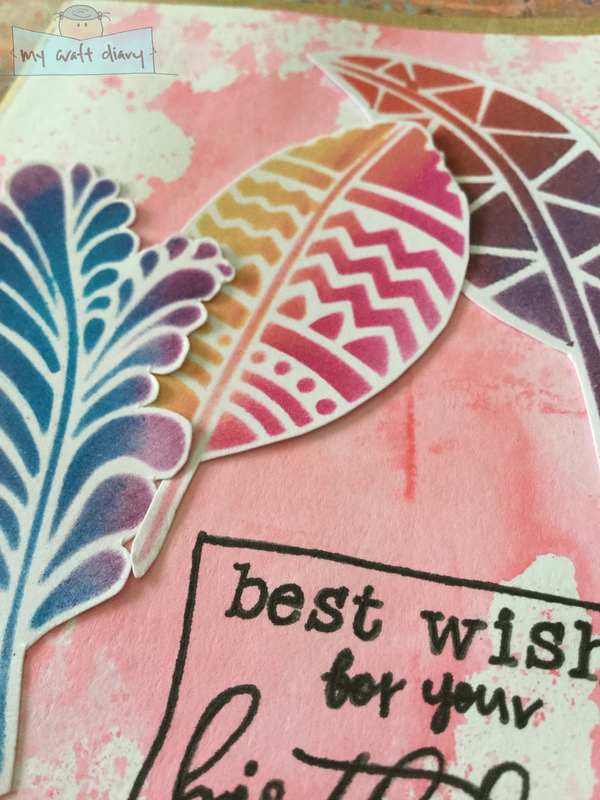 I didn’t mention this in the last post, but all of the feathers are made using this Crafter’s Workshop stencil and Distress inks in a variety of colours – they make really nice elements after cutting out. 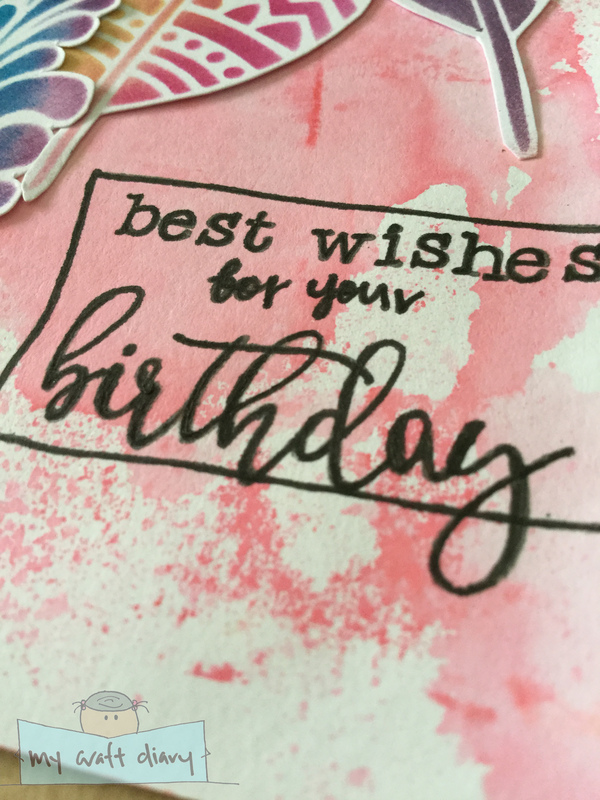 The background is just watered down dye inks – I stamped a red dye ink pad onto an acrylic block, add some water and then smoosh it to the paper. It creates this kind of painterly watercolour look, which is really nice while adding some colour to the panel. In dieser Karten benutzte ich dieselbe Federn wie die erste Karte, weil sie schon am Tisch sind. Die Federn werden mit Distress Stempelkissen aus diese Schablone schabloniert, dann ausgeschneidet. Der Hintergrund wird mit einem roten Stempelkissen und Wasser (ähnlich wie Aquarell) gemacht. 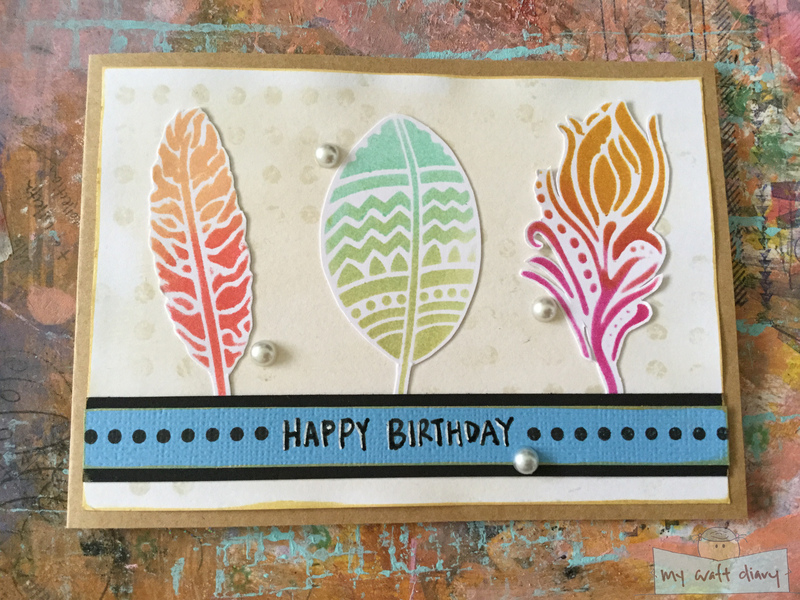 The sentiment for this card is a mix of stamping and handwriting. I stamped them on a scrap piece of paper first to make sure they would fit and look right before I did it on the panel, because I wanted the sentiment to be on top of the pink of the background, and didn’t want to make any mistake to cover it up. Admittedly, the handwriting part isn’t perfect, but it looked alright so oh well. Again, a really simple card, but I put this one together much quicker than the first card because of momentum. The placement probably helps too because the elements filled up quite a lot of space that there isn’t a lot of empty space that I feel like I need to fill up. Wie die erste Karte, diese Karte ist auch super einfach. Aber diese Karten brauchte weiniger Zeit zu machen, weil ich schon Momentum hatte. A look at the feathers. / Die Federn. A look at the sentiment. / Das Sentiment. And that’s all I have for this Card Challenge! Hope you enjoyed looking at the cards I’ve made. It’s quite a challenge to do a write up in both English and German, but it was a good exercise and a good chance for me to practise my German again. I have one more card I made in the same setting that isn’t related to the challenge, so if you like to see that, check back again in a couple of days! Und das ist alles für die Kartenchallenge! Ich hoffe, dass Sie für beide Karten Gefallen finden. Mein Deutsch ist nicht perfekt und Schreiben auf Deutsch ist eine Herausforderung aber ich hoffe, dass es nicht so schlecht ist! Ich habe noch eine andere Karte gemacht, doch sie ist nicht für die Challenge. Ich werde in ein paar Tagen die Karte bloggen, wenn Sie sich für das interessieren. Bis nächstes Mal, tschüss! I’m participating in the Danipeuss Card Challenge for the very first time and I’m here to share with you the cards that I’ve made for the challenge. 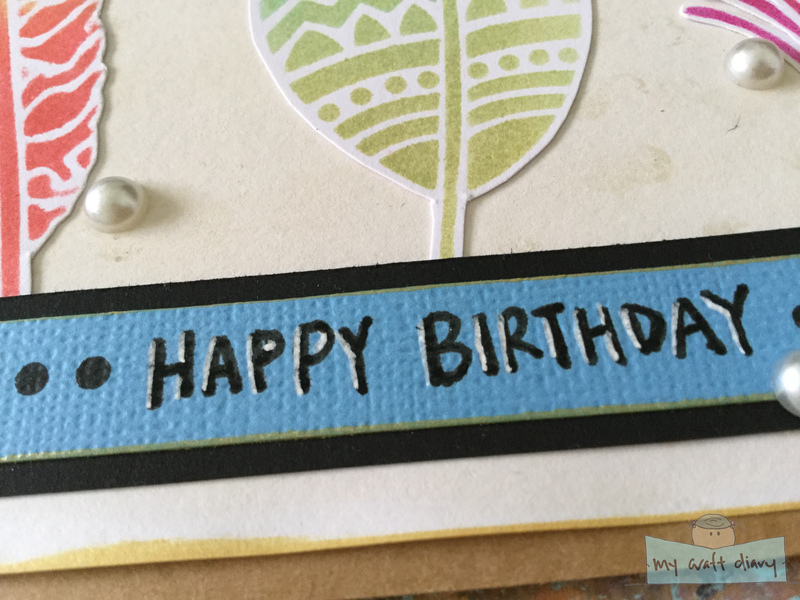 This time’s theme is “Happy Birthday”, and I have made two cards, which I will share in this blog post and another post tomorrow. Danipeuss is a new blog that I’ve found and started following recently, because it’s in German, and I really need to make sure I don’t forget the German I’ve learnt, and I quite like the content they produce. I’m also going to blog in German for the first time, so good luck to me! Hallo zusammen, heute zeige ich Ihnen meine Karte für Danipeuss Kartenchallenge #43, zum Thema „Happy Birthday”. Ich machte zwei Karten für diese Kartenchallenge, und morgen werde ich Ihnen die zweite Karte zeigen, denn ich muss die Karten in verschiedenen Posts zeigen, gemäß den Regeln der Kartenchallenge. Es ist mein erstes Mal auf Deutsch bloggen, und ich bin leider ein bisschen eingerostet. Entschuldigen Sie mich wenn mein Deutsch falsch ist! This is a simple card, but it took me a while to put it together because I was really uninspired when I started out. 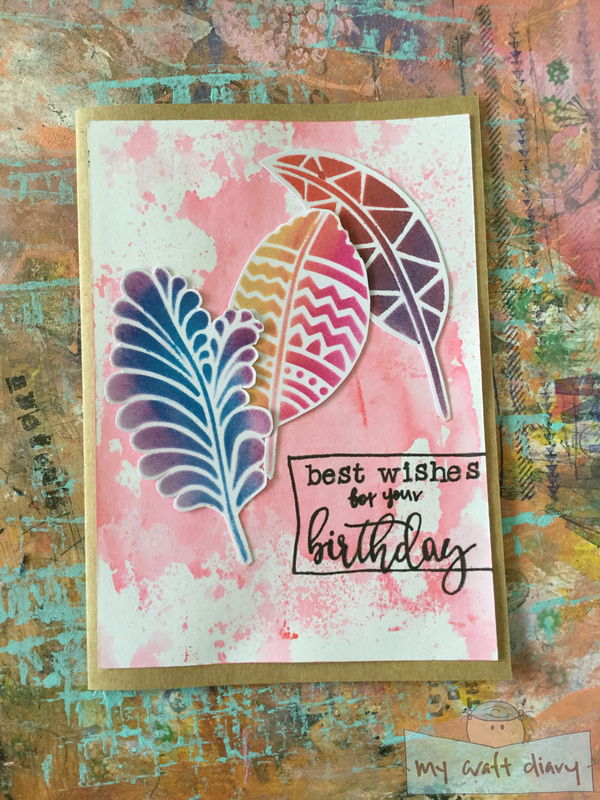 I knew I wanted to to use those feathers that I stenciled and fussy cut out but and it took me a while before I found a placement that I like, along with choosing the right colours for the feathers. Eine einfache Karte, aber am Anfang habe ich Probleme zu beginnen, weil ich ideenlos war. Ich weiß, dass ich die Federn benutzen wolle, und brauchte ein bisschen Zeit, um ein angenehmes Design zu bekommen. I started out with a blank piece of white panel for the card front and I didn’t like the bright white, so I grabbed my gouache that was beside me on the table and just swished some neutral colour down. It was still a little too plain, so I took a textured stamp and randomly stamped it on the background with an ink pad matching the background to give it some interest. Ich malte die weiße Tafel mit einen neutralen Farbe meiner Gouache und danach stempelte ich mit einen dessinierten Stempel für manchen Interessen. For the sentiment, I wrote out “Happy Birthday” on a strip of blue textured cardstock with a black pen, plus a white pen for some shadow. I then matted it with black cardstock, stamped the empty space with a border stamp and stuck it down across the panel. For the finishing touches, I inked the edges of the panel and the sentiment strip with a gold ink pad for some definition, and added some pearls for a more elegant look. Ich schrieb die Sentiment mit einem schwarzen Kuli, und dann markierte einen Schatten mit einen weißen Kuli. Zu der Feinarbeit machen, färbte ich die Panel und der Sentiment-Papierstreifen mit goldenen Stempelkissen ein und klebte einige Perlen an der Karte, damit alles ein elegantes Aussehen gibt. Pearl dimensions and really wonky handwriting of “Happy Birthday”. / Perlen und „Happy Birthday” von meinem Handschrift. Inked edges with gold pigment ink pad. / Eingefärbten Ränder mit goldenen Stempelkissen. Und das ist alles! Ich hoffe, dass Sie an diesen Karte Gefallen finden. Die zweite Karte finden Sie morgen in einem anderen Eintrag. Tchüss!